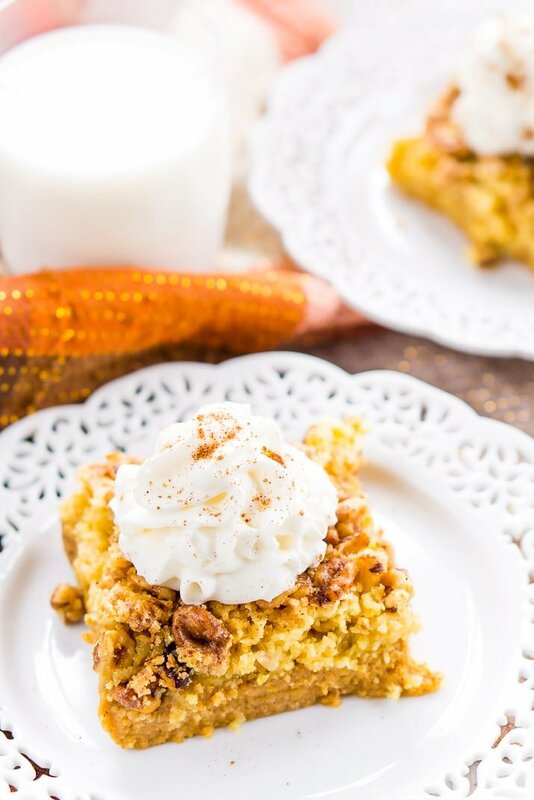 This Pumpkin Crumble Cake is the perfect alternative to pumpkin pie, this dessert’s amazing layers will impress the whole family! 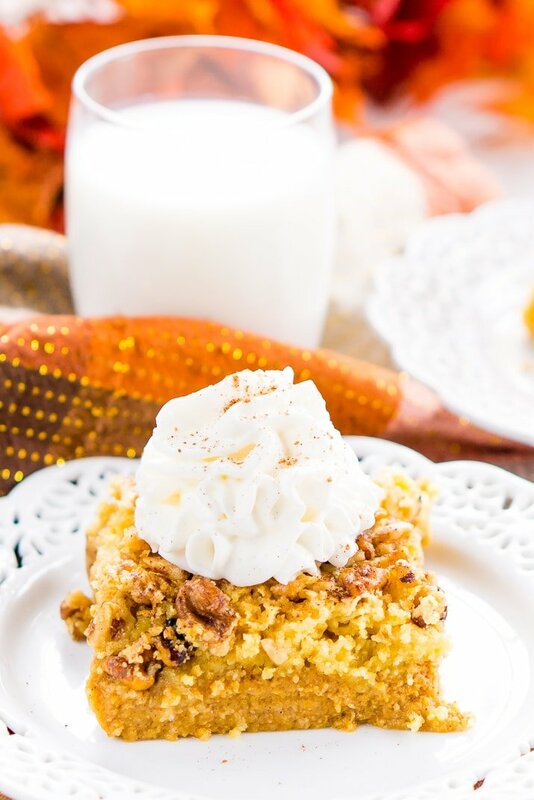 This Pumpkin Crumble Cake was one of the first recipes I posted on the blog, but the photos needed to be updated and I thought the recipe itself was better suited for fall than winter, even though I love pumpkin all year round. I got this recipe from a co-worker about a year ago, it’s amazing and I’ve made it for almost every family get together since! This warm, delicious, layered dessert is perfect for any fall occasion. 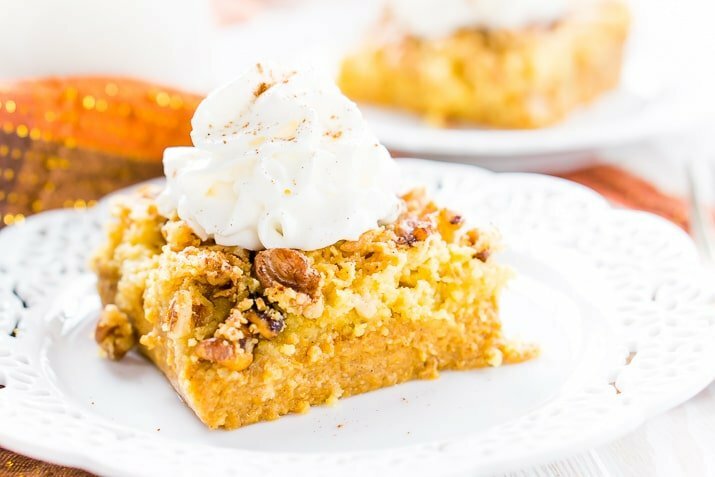 The silky pumpkin pie base, the delicious yellow cake topped with crunchy nuts and fresh made whipped cream with hints of cinnamon and nutmeg, it’s PERFECT! I made it this weekend to take over to the in-laws for dessert after my brother-in-law’s first football game of the season, there’s always a house full of people and everyone loves this dish! I have made this gluten free and it was still wonderful, you couldn’t even tell the difference. However, I have also made it without nuts, and it’s just not the same without them, they really give a nice crunch and texture to this dish. 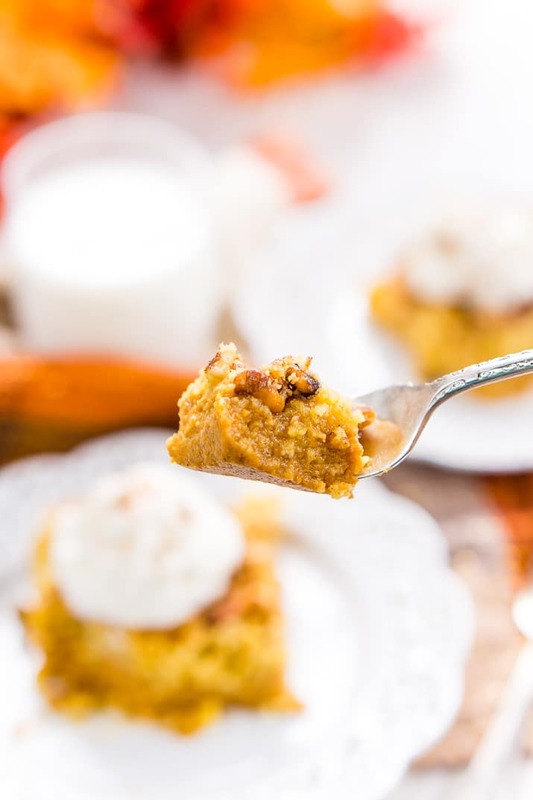 This is a great alternative to the traditional pumpkin pie on Thanksgiving, your family will love it! This post was originally published in September 2013, content and photos were updated in August 2017. The perfect alternative to pumpkin pie, this dessert's amazing layers will impress the whole family! Mix together all base ingredients (Pumpkin, milk, eggs, sugar, spices). Pour base mix into an ungreased 9 x 13 baking dish. I like to sprinkle mine with a little extra pumpkin pie spice after the cake has been added. Melt butter and pour over the cake mix. The butter will not completely cover the cake. Finally, spread the nuts out evenly on top of the cake. Pop it in the oven for 1 hour. Serve warm with fresh whipped cream and a dash of cinnamon. you made the GF versions for me, yes? YUM! 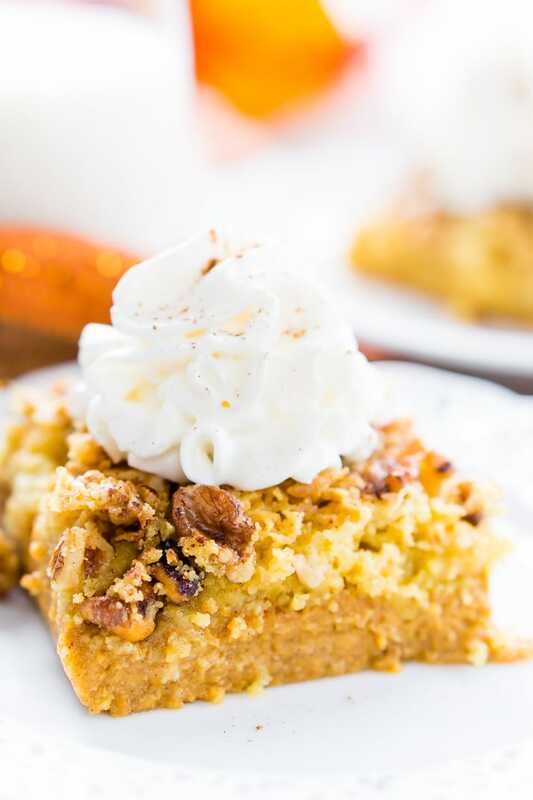 This is the perfect recipe to try this coming fall!! Could you please let me know how you did the gluten free one? Did you just use a gluten free cake mix? Yes, just a gluten-free cake mix. I usually use Bob’s Red Mill brand. I hope everyone enjoys it! I highly recommend warming it before serving if you’re eating it tomorrow! Do you think I should warm it at 350 degrees? for how long?